When I started working in Tijuana I remember thinking it somewhat strange yet plausible that some law enforcement officials could have two or three cell phones. But, honestly, there’s something about the border that triggers cell phone creep. Maybe in some cases it’s about keeping your criminal contacts separate from your legit contacts, but I also think it’s in response to cell phone carrier coverage that constantly slips and slides along the border area. I could never quite predict in Tijuana whether my U.S. work cell phone would be in U.S. local zone or Mexican roaming/international territory. Eventually, my company gave me a second work cell phone, this one with a Nextel radio. The radios drive people nuts with their beeping sounds (see the Stairs to Nowhere blog post here) but so many people have them in Tijuana that it’s almost a sure thing for regular communication. 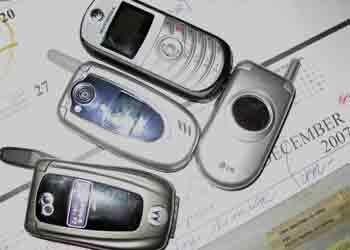 In fact, whenever you hear a Nextel beep everyone within a 5 foot radius is checking their pockets or purses for their Nextels. The radio alternative means you pay a flat service to reach anyone else with a Nextel on either side of the border, and that’s far cheaper than an international phone call. Alas, even the Nextel (now Sprint/Nextel) has its black zone areas. So having two work phones – with the radio – guaranteed that I could be reached at any time and vice versa for those crucial breaking news stories. When I moved to Tijuana, I realized I should probably have a personal phone since I didn’t have a land line. So I got a Mexican local cell phone. Towards the end of my time at the paper I got another U.S. “charge it as you go” phone as I started to redirect my life north of the border. So at one time I had four phones to make sure I could meet all my communication needs north or south of the border. I’m still waiting for the day when someone solves this problem. But in the meantime, I have learned not to rush to any conclusions when I see people walking around here with multiple phones. *The Wall Street Journal ran a Page 1 story today by Joel Millman on how the demand north of the border for cheap Mexican gas is resulting in a mini-boom in business that install extra large fuel tanks in U.S. trucks. 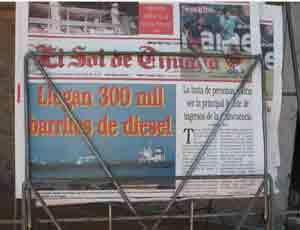 The owners are using the containers to cross the border and stash up on the fuel. *The Los Angeles Times ran a story by Richard Marosi about the flight of Tijuana’s upper-class residents to San Diego’s southern suburbs where they are seeking refuge from violence and kidnappings in Mexico. *NPR aired a four-part series by reporter John Burnett about how some U.S. law enforcement agencies along the border are confiscating large amounts of drug money in cars heading into Mexico. The money is going towards supplementing their department budgets, raising the question of whether the agencies are becoming overly-reliant on the drug cash. *Someone also forwarded me a link to an electronic newsmagazine, FLYP, about the flow of firearms from the United States into Mexico.The piece uses some interesting multimedia elements including a zippy sound that mimics the sound of turning an electronic page. 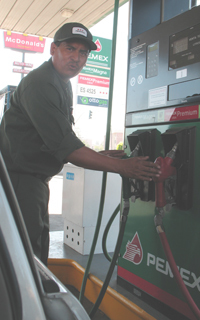 Dressed in drab olive uniforms and armed with squeegees, Mexico’s PEMEX gasoline station attendants have practically attained Superhero status in these dark times of soaring gas prices. I started buying gasoline in Tijuana a few months ago. I did it with some trepidation because I’ve always been a little wary about it. When I worked as a reporter, I once talked several times with a person who claimed to have first-hand knowledge that some Mexican gas stations were mixing gasoline with other chemicals to increase their profit margins. It was one of those stories that never panned out because it would have meant getting some expensive tests done on gasoline samples and quite possibly some illegal trespassing. So when I started buying Mexican gasoline I conducted a non-scientific test: I filled up my tank in Mexico several times and compared the mileage to what I was getting with U.S. gasoline. There was no real difference so I figured there was a reasonable chance that I was getting what I was paying for. I’ve been a convert ever since, easily saving $10-$15 dollars every time I fill up. 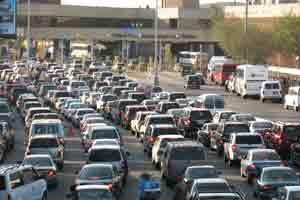 Many other border residents have discovered the joys of state-subsidized gasoline in Mexico. The San Diego Union-Tribune has been running stories on border commuters sucking the stations dry. All that business has the PEMEX crew pretty busy. They pump gas for you, they clean off your windows and if they’ve got time they even check the pressure of your tires. They don’t need to wear a cape or have superpowers to pull off their act. Plenty of grateful customers feel like they’ve been saved when they pull out of the gas station. Call it trial by tire. For five years my work week involved commuting into Tijuana from San Diego in the mornings, and then joining the line of cars back north in the evening. When I lived in Tijuana for two years after that, I continued to creep north slowly during weekend pilgrimages along with what seemed like half of Tijuana on their way to Kmart or Coach. Over the years I came to accept that inching along at a snail’s pace is perfectly normal, and now everything seems to pale in comparison. My current commute into Los Angeles should take about 30 minutes when the traffic is moving normally but actually takes an hour. For some reason that doesn’t bother me, especially when I hear a familiar voice on the radio. This week, NPR in L.A. aired a report by Amy Isackson of KPBS-San Diego about a Tijuana woman who built a recycling machine that is used by former trash pickers – pepenadores – at the city’s trash dump. I almost felt like I was back in Tijuana again, as the stream of cars stretched out in front of me and sounds of Tijuana rushed through my car stereo. I’m doing some catch-up with this blog and I wanted to include a link to a Frontline/World documentary on corruption along the border that was aired in May. “Crimes at the Border,” which was done in conjunction with a New York Times report, focused not on corruption in Mexico, but on corruption among our own U.S. agents and officers. This is a topic that would have pleased Jesus Blancornelas, the crusading Mexican editor of the Tijuana weekly Zeta (who died in 2006). Reporters were always making pilgrimages to Blancornelas to quote him for their own stories on drug trafficking and corruption in Mexico. On my first visit in the first few months of 2000 he talked about how Mexico gets a lot of international flak for not doing enough to curtail drug trafficking and yet he believed there’s something fishy going on in the U.S., too, if the drugs are making it to the streets. The Frontline piece looks at some of those fish. Disclosure: I helped the Frontline crew out with the Tijuana portions of the program. The international cow exhibit made it to Tijuana, and the timing couldn’t have been better. After a grim year of drug-related violence the city needed a little levity. I saw the cows for the first time while paying my cell phone bill here a few weeks ago. I wasn’t sure what was more amazing: The sight of colorful, sculpted bovines perched along the city’s streets or the sight of Tijuanans smiling and taking photos, strolling in public as if there wasn’t a chance at all of being caught in the middle of a shootout between feuding drug groups. Their reactions sort of reminded me of what it was like back in college when people emerged giddy from those nasty, long Chicago winters. A few days later, however, I learned that at least one, possibly two, of the cows had been stolen. Several suspects have been taken into custody. The exhibit, which can be seen along Avenida Revolucion and Paseo de los Heroes, reportedly lasts through July.